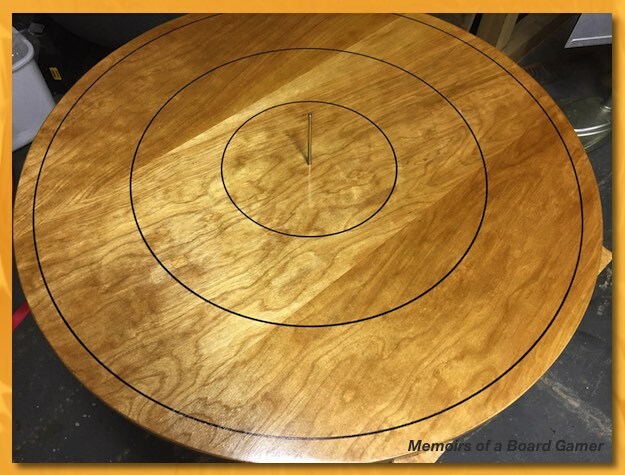 Since I made my first Crokinole board I’ve been itching to make another but I wanted to try some different techniques in hopes of making it a little more predictable with much less “hoping and praying” things would turn out. 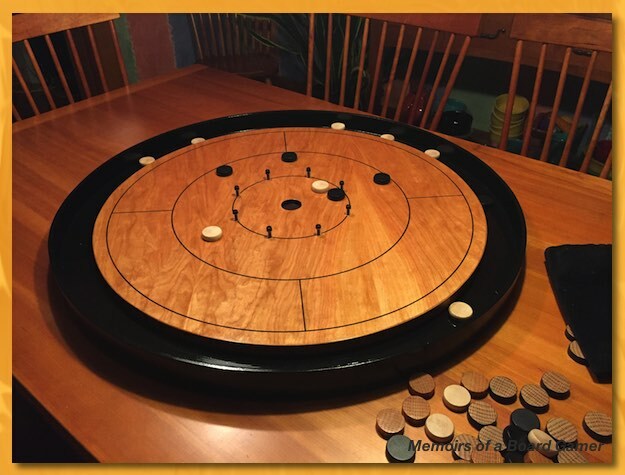 In the back of my mind I’d like to think I could make a few boards and sell them to raise a bit of cash to fund my board gaming hobby (or my desire for new backpacking equipment for that matter). I looked around in my shop and dug out some scrap cherry plywood I had. 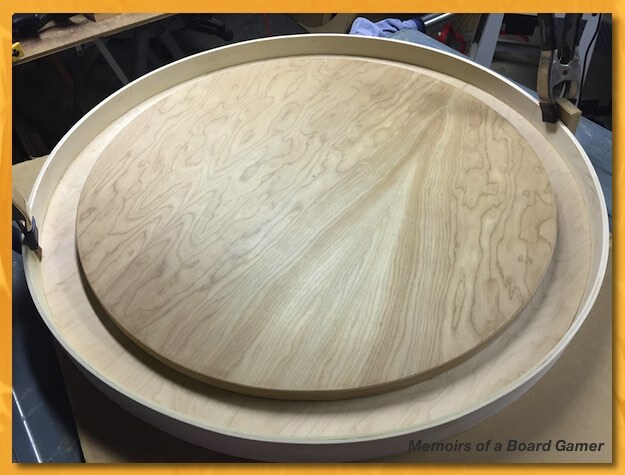 I was only 1/8″ so I backed it with some 1/2″ birch and cut the large disc out of birch plywood. 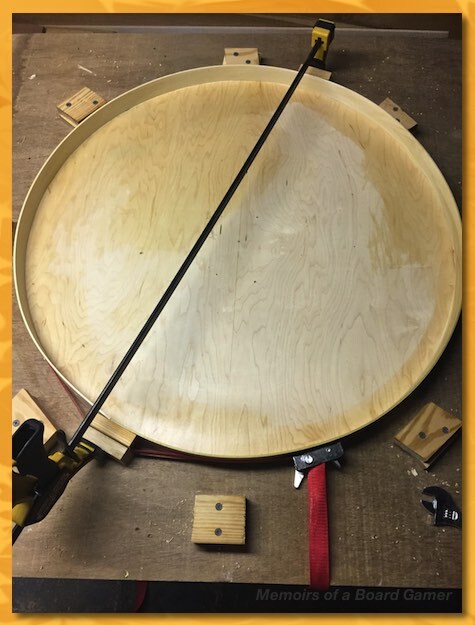 I banded the inner cherry disc to hide the plywood edge using a ripped strip of hardwood cherry I had in the shop. 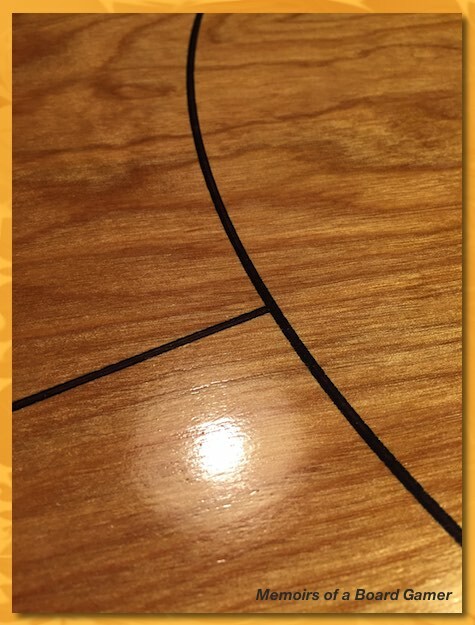 While that was drying I ripped several strips of maple, the exact same type I used on my first Crokinole board and boy did I run into problems with splitting. 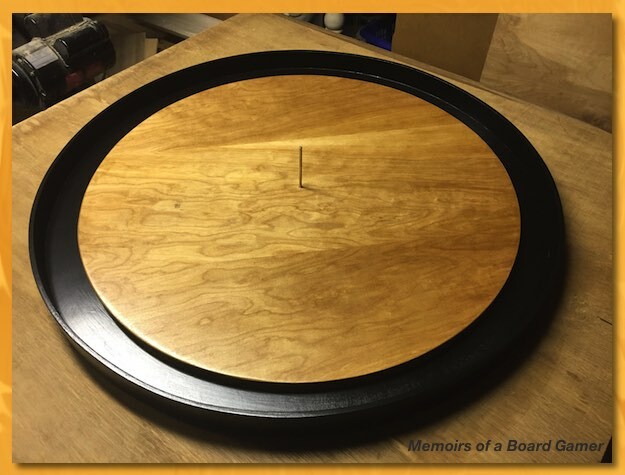 The gutter wall takes two thin strips of wood wrapped around the large disc and every time I would try to mount the first strip it would split horizontally due to the stress near the point that the two ends come together. After four attempts I finally got the first layer on successfully. The second strip went on without issue and I clamped it all up to dry for the weekend. After that was done I decided to paint the bottom disc and gutter wall black using glossy furniture paint. 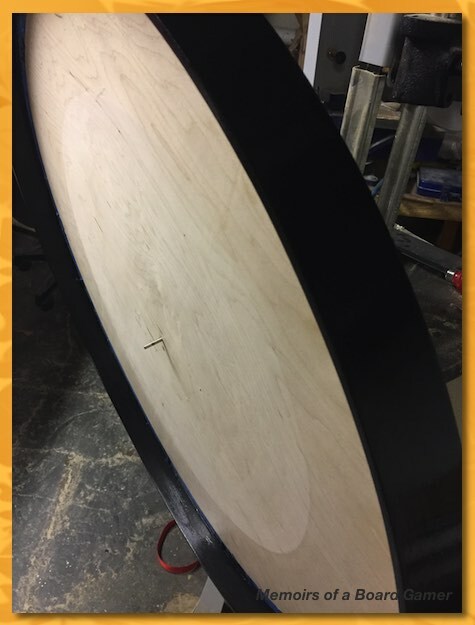 Here’s a shot of the upper disc (with a few coats of poly) sitting inside just to get a feel for how it was going to look. 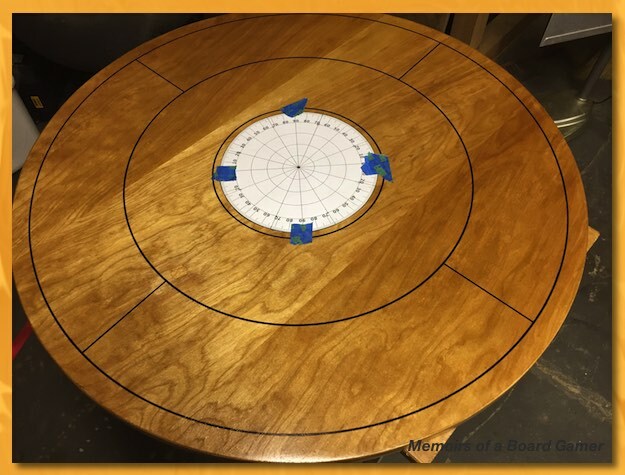 Now that the first few coats of poly was dry on the upper disc, I turned my attention to the lines and reused my homemade Erector Set compass and Sharpie since that worked out so well last time. 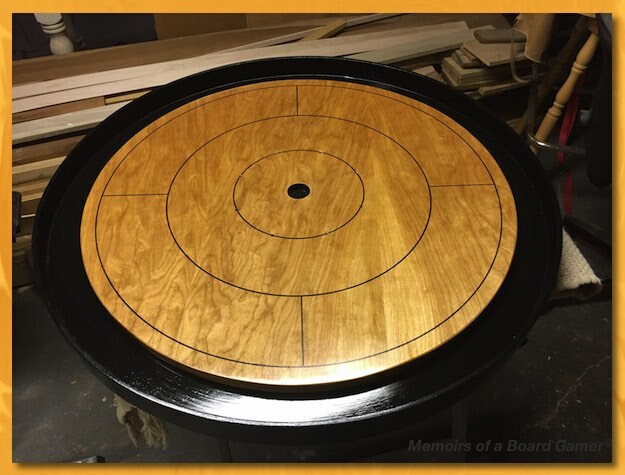 After a few more coats of poly to protect the lines, I used my hole drilling template to mark and drill the eight holes plus the center hole. I then mounted the center disc permanently to the lower disc, added three more coats of poly and installed the painted and poly’d pins and the 1/2″ clear plastic tubing. Overall, I’m happy with the look of the board but there’s a lot that I’d like to improve on when I make my next board. 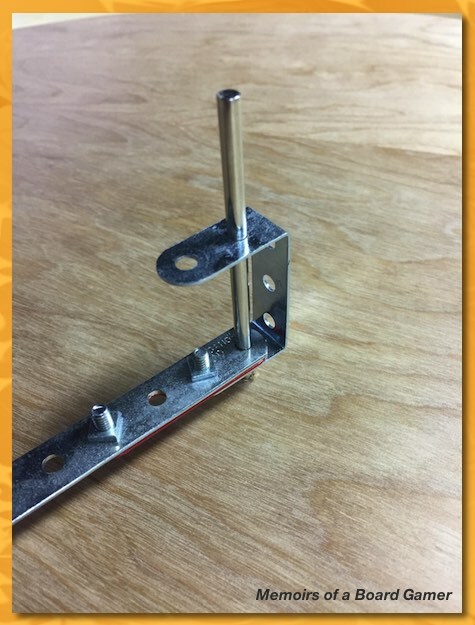 The bottom board is a bit uneven and there was initially a rocking motion when you set it on a flat surface. 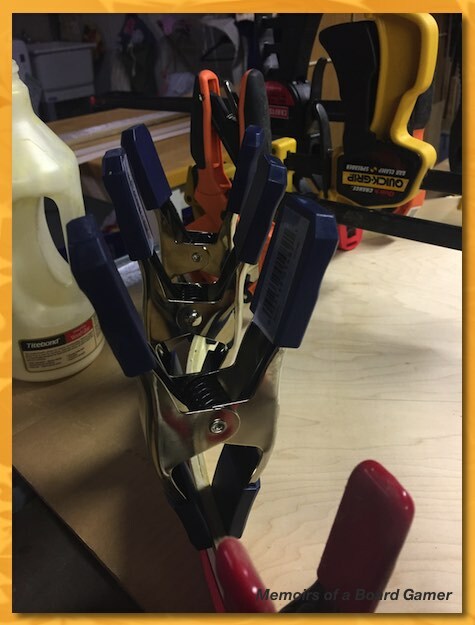 I’ve fixed that with some felt pads but that bothers me and I should have noticed that earlier. 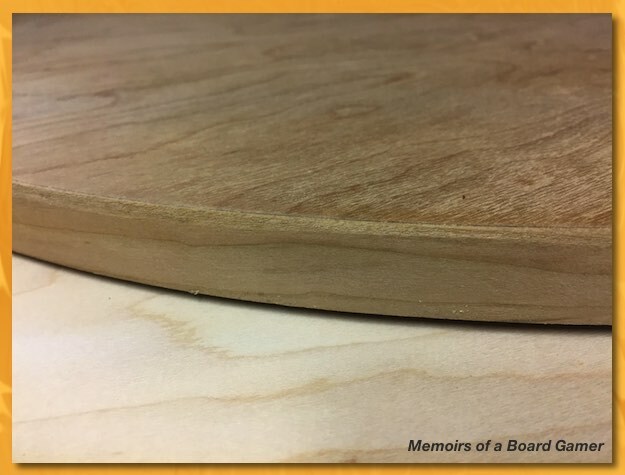 I’m not happy with the paint and I fear that every chip and dent will be visible in the surface detracting from the overall presentation of the board. And finally, I’m not happy with the smoothness of the paint. I can see brush lines when light reflects off the surface and I can feel it when I rub my hand down the side of the gutter wall. However, there’s always next time.